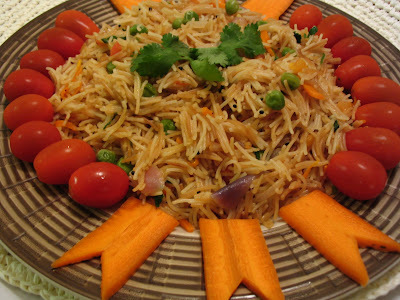 Vermicelli upma easy to make and it makes the dish so healthy by adding more vegetables. It is perfect to serve for breakfast or dinner. 1. Heat ghee in the frying pan and add the vermicelli roast it until it turns slight brown colour. 2. Now remove and keep it aside. 3. In the same pan heat the oil and add mustard and dhal one by one. 4. Now add the green chilli, ginger and curry leaves. 5. Add the onions, tomato and saute until the tomato are mashed slightly. 6. Add the vegetables and saute just for 2 minutes. 7. Now add the garam masala and salt. Pour the measured water. 8. When water boils well add the roasted vermicelli and put in very low flame. 9. And close the lid 3/4 when all the moisture is absorbed mix well and garnish with coriander leaves. Add the vermicelli when water boils well otherwise the vermicelli will be sticky. Do not saute vegetables for long time so that it looses its crunchiness at the end. yummy in the tummy! I love ssemiya upma... 2 wonderful posts today! looks great! Easy and comfort breakfast...looking yummy pavithra..
wow wat a presentation!!!!!!! Awesome it is!! And Pavithra, i will post shortly dear! A simple upma it is......u decorated it like a bride!!!Superb. Both decoration and upma are marvelous! Comforting breakfast! I love the crunchiness while eating this upma. delcious Upma with Vermicelli...and nice decoration. wow, where u get ur ideas for presentation? You are too good. Thanks for telling me the difference between adai and uttapum. oh boy! great pic. lol...y do u kill me daily with such nice presentations...thats looking absolutely fabulous..
Maybe, you should name is sunflower vermicilli or vermicelli medal...I really need to applaud you for taking the time to decorate it so well. Thankyou for visiting my blog. Even those who dont like Vermicilli upma will begin loving it after seeing the lovely decoration. Its attracting!! Thanks for visiting my blog. You have very nice blog. Hi all thanks for ur lovely words and i happy u all enjoy my garnishing.